The customary April Fools prank on MFGG is to change the forum in some way. Not often is the site itself affected. 7.3 What about the main site? 8.1 What About The Main Site? 12.1 What about the main site? 13.2 What about the main site? 14.1 What about the main site? 15.1 What about the main site? MFGG was changed to WFGG — Wario Fan Games Galaxy, and Wario was made an admin, the entire event was sudden and unexpected, and very very subtle, taking a few minutes for everyone to notice. Some people wondered if Wario was an Admin in disguise, or if he was some kind of hacker, but it was enjoyed all the same. 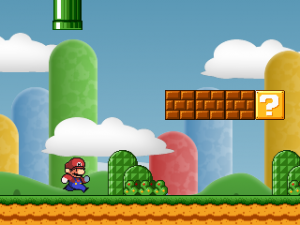 Some forum images depicting Mario were changed to Wario, such as the main Logo. Simultaneously, some avatars and signature images of various members were modified or altered slightly, such as being flipped upside down, inverted or swapped with other members. The only complaints came from 1 or 2 individuals who wondered if they'd get their avatars and sigs returned, however all images, sigs and avatars were saved, and returned to normal once it was over. While an Admin, Wario made a number of posts about money, saying for members to give him their coins and things like that, and other people played along, eventually creating more joke accounts such as Mario and Luigi, when this happened it was clear the prank had reached its peak, so this is when the April Fools joke came to a close. This April Fools prank was a spur of the moment prank pulled off by Kritter. The 2004 April Fool's prank is highly controversial, and begun the Spy vs. Spy-like battle between Shadowman and Retriever II. The recently elected administrator, ShadowMan, changed the forums to Waligie Fangames Place based on a cult hit fangame, Waligie Bros. 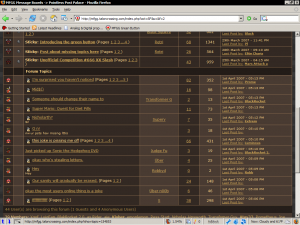 The forum was changed to a blinding uniform white, and all fonts were changed to System. Some liked the skin, but most administrators despised it to the point of editing posts to make it seem that more people disliked it. Near the end, all the forums were removed except for one as a member named US Army claimed to have arrested Waligie. The new host of the forums, Retriever II, decided to prank ShadowMan in retaliation. The administrative controls were reverse-engineered so that ShadowMan no longer had the ability to change skins. It took nearly an hour before ShadowMan was told this, which infuriated him, much to many's delight. In an effort to fix it, however, all the Waligie skin images were replaced with default ones. The forum images remained to be in the /waligie directory for nearly a year. The 2005 April Fools prank is considered to be the most elaborate. ShadowMan, with the aid of Klobber, changed the forums to Uncle Billy's Spanish Chicken Shack Fangames Galaxy, or Choza Espanol de Pollo Galaxias Fangames de Tio Billy. The traditional blue colors of the forum were replaced with various images of wood planks, ShadowMan became Tio Billy, and the language on the forum was changed to be Spanish. 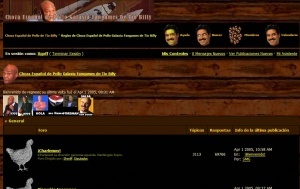 All images on the boards revolved around either Mexico, Spain, or Tio Billy, depicted as George Foreman. A regularly changed MIDI file was also played in the background. This prank was well-received, and more smoothly executed than that of 2004. Once again, Retriever II pulled a prank on ShadowMan in revenge. This time, Retriever II prevented ShadowMan from changing his name back to ShadowMan, forcing him to be Tio Billy forever. Taking another counter-measure, Retriever II changed the password to MFGG's FTP, preventing ShadowMan from removing the "deny" code from the Admin CP. However, ShadowMan obtained the Penguinia FTP password from Klobber and manually changed the file to a working one. Unfortunately, the one ShadowMan uploaded was from an older version of Invision Boards, which nearly destroyed the functionality of some features. 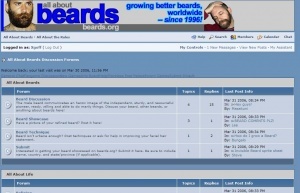 Forum replaced by All About Beards. Because of the Religion/Scientology forum, a huge flamewar ensued. ShadowMan considered this to be a great disaster, as the skin was only up for a few hours and then disappeared. ShadowMan blames the poor execution of the prank on his (at the time) recent case of pneumonia that he had developed the week prior that completely debilitated him. Retriever II edited the boards so ShadowMan only had access to the Beards subboards and could not see the normal sections (such as General Chat and the Pointless Post Palace). This was quickly changed back. The first thing that has happened is the names of all the members have a letter missing and changing randomly. It is unknown if this is the work of ShadowMan, Retriever II, or someone else. Later on, it was expanded upon, supposedly by ShadowMan. Instead of a single letter being removed, the name instead would be reduced to a random length, often 0. This caused many of the usernames to appear blank in the topic list and the "Who's Viewing" list. The sprite sheet of "The Fire Demon"
Reviews for the games were mostly positive, but the positive ones are faked. Many of the main site goers did not catch onto the joke. "Toad Strikes Back 2 (Demo v.1)" by Thunder Dragon - Claimed to be a demo of a sequel of Toad Strikes Back, but was really just a flashing black and white screen saying "April Fools!" "Super Mario Epic 3" by Jeff Silvers - Supposedly the full game of Super Mario Epic 3, but was really just a flashing red and blue screen saying "You lost the game!" while the window moves erratically. "Super Mario Theta" by Mario Gamer & DJ Yoshiman - Another false demo, simply consisting of a hole swallowing up the computer screen while a creepy sound effect plays. "Luigi's Game Demo" by ShadowMan - Upon opening up this "demo", it acts like a word document. It also attempts to print a screenshot of the game window. "MPUZ" by Xgoff - The only "real demo", it is a collection of Mario games featuring sprites from the Hall of Shame and flashing screens. Most people got the joke, so sarcastic reviews were also added. Also, a sprite submission was accepted, called "Colored Chibibo" by Marioman2002, a sheet smaller than the thumbnail, featuring only two sprites. Additionally, a Klik Library called "SSJ MARTH 23'S FIRST LIB!!!" by SSJmarth23 was submitted. It also includes an executable for those without a Clickteam product. It's a stereotypical showcase of a variety of useless (and sometimes non-Mario) sprites, with only a Beer Penguin from the Japanese version of Wario Land 2 being remotely useful. It also holds cliché submissions such as a Super Saiyan Shy Guy. The password eventually being revealed as "flaccid_fish". Later, because CCC was password protected, the GC was thus made a "temporary CCC". Then the forum experienced "Flood Control 2.0", where the topic buttons would "fly" about whenever a user wished to make a topic, occasionally giving out messages mocking the user. Due to The Great Mistake the plans for the 2008 April fools were drastically altered. Originally a fake forum 12 was to be made, but time restraints stopped it from happening. April Fools 2009 was mainly organised by Black Squirrel, who had started to work on it in late February of that year in an attempt to beat ShadowMan's previous pranks. Instead of one skin for the whole board, he decided to make one for each forum. Furthermore Ing was filtered to smurfing (which broke the filter, and the result ended up being smurfsmurfing). Pressing the "M" key on the keyboard anywhere on the forum would make a picture of Bill Cosby appear on the page, which can be clicked on to make it go away. Two joke members were added to the forum. Vince (from ShamWow commercials, indeed in revenge against the Cillit Bang skin of GC), and Spy (from TF 1 & 2.) Both had an unusual hate for one another and constantly faught back and forth. Their identities were revealed at the end of the day, being HtraM and Gameboy, respectively. As well, DJ Yoshiman was made admin and was deemed "Supreme Dictator DJ Yoshiman." He banned three individuals for one hour separately under the impression of "resistance to his actions." News Forum with various graphs here and there. Submit-it with the default skin, only the images replaced with more "nooby" ones. General Chat, or Cillit Bang Games Galaxy - Bang and the posts are gone. Arts Board had the look of The Spriter's Resource. Wifi and Online Gaming had the Life on MFGG skin. In the Help Forum everything was black. All images were also removed. Casual Conversation Castle was taken over by communists and everything was written in capitals. General Friendliness had the All About Beards skin. Unfortunately Black Squirrel ran out of time, and so the WiFi and General Friendliness forums had to make do with older skins. The Archives and the forum index remained unchanged. Later on in the day, several MFGGers were sent to "THE VOID", a place devoid of light and life. These few MFGGers fought for their lives against unstoppable odds and cruel spammers. They had no knowledge of what was happening in the outside world. Initially the void was controlled by Dalek Caan with help from Quackers. Dalek Caan would later send Dalek Jast about to capture people. Later on Davros appeared for some reason. The Daleks promptly took over the CCC when MFGG's guard was down. They remained there silent for a long period of time. Eventually, every section except for MFGG and THE VOID disappeared. MFGG eventually mysteriously disappeared as well; it was implied that The Void consumed the lost forums. Fortunately, there is a happy end to this story; eventually all the sections were restored (without their changed skins), and THE VOID vanished. The swirling maelstrom of hate might not return, but no one can know for sure. Shadowman, assisted with Techokami, decided to get even with Retriever II by editing the board files so that instead of seeing the forum, RII would be linked to this. What about the main site? The main site got 2 fake games, one featuring Waligie, and 2 fake sprite sheets, one sprite comic by OmegaF. and one Mario sprite with Nelson Mandela's head pasted on top. All these submissions were deleted about 5 minutes before THE VOID vanished. April Fools 2009 was rushed, and so many skins were missing the odd image. The Void was created as a "jail", following the lessons learned from the Life on MFGG event. The purpose was to store members who complained there, though in an unanticipated turn of events very few rules were actually broken during the night and only Mr. Bird was moved there for a genuine reason. This lead to Black Squirrel quickly coming up with the idea of "capturing people". When BS signed off for the night due to timezones, Techokami continued what he started. Though Techo does not watch Doctor Who so some ideas were changed. All three Dalek-related accounts (Caan, Jast and Davros) were controlled by Black Squirrel. This, plus the controlling of the Quackers account meant that BS had far too much free time on his hands that night. The Sniper was being manned by ShyGuy Grey. The position of Dalek Thay was offered to Techokami but was denied. Dalek Caan and Dalek Jast were originally unused Security Droids. Davros was originally a banned member who had not posted. This is why their join dates were from 2005/2007. BS captured the accounts and put them to good use. April Fools 2010 was mostly set up by Char and Guinea, who started planning mid March. The first thing that happened was that the boards became Greek themed. This included changing a lot of the text to Greek, and embedding Greek music on the main page and "Γενική συζήτησησυζήτηση" (General Chat). In an announcement the first five people who posted a Greek god got to be a "Greek Member" who apparently had mod powers (due to a mistake which was fixed). A PPP forum opened, however there was a password on it, and the skin was changed to "lights out" (at least on the password screen) where everything was black. You could still navigate the page by highlighting the page to see the text. Later in the day, links made a clicking noise when you clicked them, and would not load. This only lasted a couple minutes. After those couple minutes, slow_clap.gif started moving, depending on where people's cursors go. At the same time links started disappearing. The Pointless Post Palace was also apparently replaced by the Ωffhand Ωration Ωlympus. The music on the front page also became a lot more epic. It was then that Ω appeared and took over MFGG. He demoted Guinea and Char, and made people answer a puzzle riddle to get the password to the Ωffhand Ωration Ωlympus. The first five people to get in and make a topic getting 20 posts got an Event Badge and Greek Membership. The Ωffhand Ωration Ωlympus was basically the CCC for a day. Before long the password was leaked, and everyone went into the ΩΩΩ. At the end of the day, the ΩΩΩ was archived, along with all other April Fools related topics, and everything went back to normal. The Greek Members were Starmang (Σταρμανγ), Gato (Γατο), Kyori (Κυορι), Raie (Ραιε) , Waddle dee (Βαδδλε Δεε), Mewizkuit (Μεβιθκυιτ), rtsmarty (ρτσμαρτυ), El Huesudo II (Ηλ Ηυεσυδο δυο), Sigma (Σιγμα), Fidu (Φιδυ) and DavidCaruso (ΔαβιδΚαρυσο). MONEYMAN also got his name changed to "MONKEYMAN" and became a (fake) moderator. Biddy also became a (fake) badge mod. The mainsite got a joke submission that was apparently Sonic from Sonic Advanced, but was really a bunch of poorly sprited Goombas. There were also sprites of former U.S. Vice President Spiro Agnew and a British tileset. Also Mecha the Slag submitted a joke game. The 2011 April Fools Day, the first after The Split, was considerably toned-down from previous pranks, and the only thing that happened was a joke mainsite update that appeared to include an updated version of Thunder Dragon's critically-acclaimed Psycho Waluigi. However, the game turned out to be a new Waligie game, Physco Waligie. April Fools 2013 was somewhat one of the more active April Fool's since The Split. Several members pulled out top quality games with impressive screenshots which turned out to be horrible. Several sprites that were accepted turned out to be some modified versions of works made by famous classical artists. Mario Minigame Mayhem received -128/10 by DJane Coco. After the hoaxes, VinnyVideo notified MFGGers to stop abusing the review system beyond the range from 1-10. A list of some of the submissions that were uploaded to the main site on April Fools 2014. 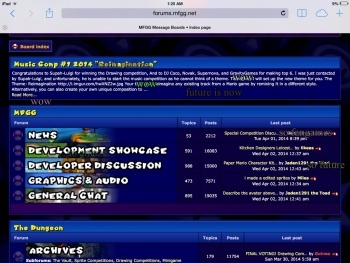 The forums, as it appears on April Fools 2014. April Fools 2014 was also very active. 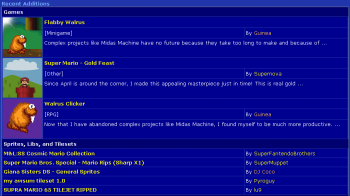 Just like April Fools 2013, the mainsite received several joke submissions, mostly sprites, such as a ripped "SUPRA MARIO 65 TILEJET" by lu9, and "supra mayro galexy 64 ds sanic returnz lekd grafix" by terrariaplaymc, just to name a few. In addition to this, there were also two Walrus game submissions. 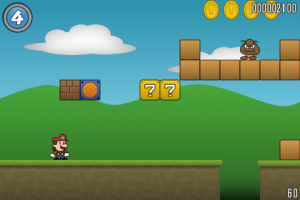 "Super Mario: Gold Feast" was also submitted by Supernova, which was also a joke submission. The MFGG message board was also prepared for the April Fools Prank. "Wow, such doge" among other things, would appear on random parts of your screen throughout the forums. This prank was orchestrated by Techokami. VinnyVideo made a thread in General Chat titled "The Admin Power Abuse Thread". Those who chose to post in this thread had their accounts altered in various ways, things such as a random user name change, or a badge suddenly being replaced, among other changes. April Fools 2015 was built around two main pranks, the "planned" implementation of Tusk Bucks, and the return of the PPP, now known as the Premium Post Palace. Tusk Bucks are a micro-transaction currency local to MFGG which you can spend in certain fangames to unlock bonus content such as more costumes, characters, or levels. Tusk Bucks can be earned by commenting on the forums, earning badges, voting in competitions, and downloading fangames. Entry to the Premium Post Palace in based off of subscription. By spending Fifteen Tusk Bucks, you can gain access to the Premium Post Palace for one week (though the first day of its launch was free so everybody would know what they're paying for). It is unknown if you can gain Tusk Bucks from posting comments in the Premium Post Palace. While threads in the Premium Post Palace can vary from any degree of jocularity and length, DJ Coco did say not to abuse that. Although the Premium Post Palace was only opened for a day, a hundred-fifty-seven threads were posted on it, with a total of 1,257 posts. In it, several members had requesting that their status be changed. Cornflakes was even promoted to Global Moderator! On the MFGG mainsite, three April Fools submissions were submitted, including two games (Mariola Adventures by lu9 and Mario Learns about Text by Elyk) and one sprite sheet (Mariola Sprites). 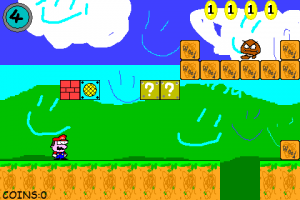 Mariola Adventures by lu9 tells of Mariola's adventure to rescue his mother from enemies. Mario Learns about Text by Elyk is simply just a text document. The manipulated scores incident returns when Friendly Dictator posted an 11/10 review for Mario Learns About Text, the second time after DJane Coco rated Mario Minigame Mayhem -128/10 two years ago. In tandem with this, VinnyVideo posted a misleading mainsite update stating that nothing foolish is going to happen on April 1. Despite this, the April Fools submissions were shown. On April Fools Day 2016, the forums were altered to revolve around the 90s Nickelodeon sketch comedy All That. Upon visiting the site, users were greeted with a new All That-themed skin that was based off of Fire Flower. Unlike the Greece Skin from 2010's April Fools joke, this skin remained accessible past April 1st. In addition, a new subforum called the All That Post Palace was added. This forum was very similar to the Pointless Post Palace, but with the catch that all topics must relate to All That in some fashion. Failure to comply with this rule usually resulted in the staff vandalizing the offending user's account with Dan Schneider-related imagery. The News subforum also became Vital Information (named after the iconic sketch). Even before the vandalism, several users turned into (and roleplayed as) various All That characters. HylianDev became Hylori Beth Denberg, Vitiman became Pierre Escargot (and later Milkman) and Dustinvgmaster became Repairman-man-man. In addition, They were given the News Lady, Good at French/Dairy and Security... Umm... member bars, respectively. Blutorus was originally Super Dude, but this was changed due to sudden circumstances. Things, however, took a strange turn when several subforums were turned into redundant Vital Informations. This was eventually pointed out by Cap'n Coconuts (roleplaying as the Amanda Show character Penelope Taynt at the time). Repairman-man-man took it upon himself to fix the problem, but only ended up turning every subforum into Vital Information. This was eventually revealed to be the doing of Milkman (played by Vitiman), who was pretending to be Pierre Escargot. Milkman then declared his intent to take over MFGG. However, Super Dude appeared (played by Dustinvgmaster under a dupe account) and fought Milkman. Eventually Super Dude was victorious and the subforums were returned to normal. Super Dude possessed the Lactose Intolerant member bar, referencing his weakness. A group of three joke/April Fools fangames swooped into the mainsite, which include "Lucina & Little Mac Go to Dreamland" by VinnyVideo (not Mario-related), "Super Mario Boom" by Supernova (which is actually a jokegame), and "Psycho Waluigi: The Return to Unconcia (DEMO)" by Blutorus. Two joke/April Fools submissions for sprites were submitted to the main site, which were "Super Saiya-jin Luigi Holding a Shotgun" by Supernova, and "Grand Dad" by Lu9. The former was actually an NES Mario sprite sheet in disguise, while Grand Dad is actually a single sprite. VinnyVideo posted a new status update on the mainsite that it's just an ordinary update. This is not ordinary as April Fools submissions were posted on it. The 2017 April Fool's prank was, debatably, the most cunning yet - nothing happened (well, almost). Surprisingly few MFGGers complained about this. Five games in the so-called "Cool Maryo" series, submitted by MisteryT1MFGG, have given the website's lack of submissions a big whack on the head. Mr Yoshbert has also posted a new "Surprise April 1st Update" on the mainsite, showcasing the newly submitted games. Despite giving them quality remarks, it turns out that it's actually sarcasm and the games are low-quality than what most MFGGers should have expected. For the third time, the "Manipulated Scores" incident strikes once more when Pufflehugs posted a review on the "quality" game "Cool Maryo 2: Lurygi's (not) Kong Quest" with a rating of 100/10. Jaden1291 the Toad reacted to this by proclaiming that he has something to edit in this article, while chuckling all long. MFGG was bought out by its affiliate site, the Talkhaus. The forums were changed to have the design of the Talkhaus, and there was a contest to "Make a Good Armless Bipedal Cycloptic Demon (ABCD)." MFGG itself bought out the SMBX forums, and that site's design was changed to look like MFGG. Another thing that happened during this was that an unknown user with the username "Nintendo of America" made a thread with a fake cease and desist mention, threatening to shut down the site if the mainsite didn't remove all of the submissions, or didn't give Friendly Dictator the rolling Mario badge. Six submissions from Chay-O feature Demo (the main character of A Super Mario Thing) in different styles, including MFGG fangames, as well as content from ASMT styled in other art styles. Games included a parody of Toad and the Ancient Keys where Demo must find the ancient leeks, a "final" Super Charisma Bros. game, a remastered version of Super Mario Bros. Dimensions DX, and a serious joke game named Discord Disco Mario. For the first time ever, Jaden1291 the Toad finally submits a joke submission, a tileset lazily made in MS PAINT which he sarcastically claims to be his "best extended tileset ever." On April 5, after the event, an April Fools compilation featuring all the games submitted for April Fools Prank 2018 was released on the mainsite. Even after this April Fools Prank, rockythechao's M&L:SS Catllama sprite sheet remained for a longer time on the site. This led to Jaden1291 complaining that this remained longer on the mainsite after the event. This page was last edited on 8 October 2018, at 22:32.